Identifying eye hurricanes is a main focus for the Cyclone Center team, but it is presenting some challenges for our citizen scientists. Storms with real eyes are being categorized very well, with 80% to 90% accuracy in storm type. However, storms that do not have eyes but look like they might are proving more difficult. Many things, like blurry images or dark blue or white clouded centers have been shown to cause these mistakes. A bizarre example of an image on Cyclone Center that is very misleading is the storm CYC1981. 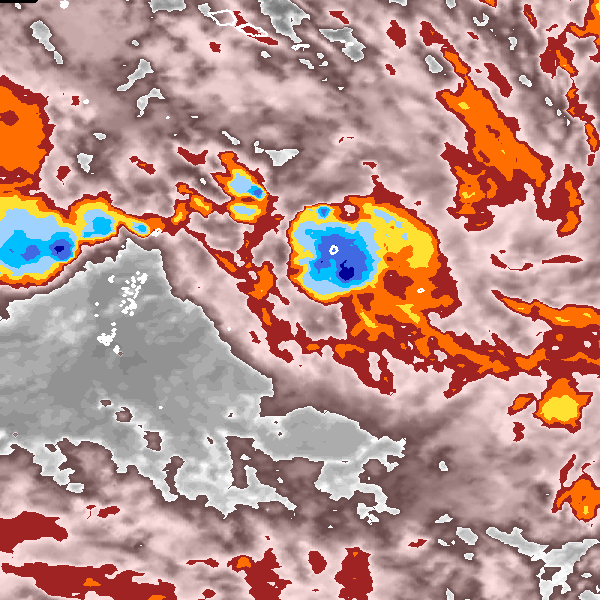 The small white circle in the very center of the storm that at first glance looks like an eye is actually the island Niue in the South Pacific. The satellite image was taken as the hurricane passed over the island, and the white land boundary lines look like the eyewall. Unfortunately, with the size of the images on Cyclone Center, it is hard to determine if this storm has an eye, and since having an island in the middle of a storm image is a rare phenomenon, it would be easy to assume that it did. This image of CYC1981 even stumped most of our science team, so don’t feel bad if it tricked you too. So how can we tell if a storm is or is not an eye storm? Many storms look very similar in size and shape to eye hurricanes, but they lack an actual eye. There are a few things that you can look for, however, to determine for sure whether or not the image you are looking at is an image of an eye storm. Is the center of the storm surrounding the eye cold? You can tell this by the color of the clouds—shades of red, orange, and grey signify warm clouds while blue and white areas represent cold clouds. Is the eye itself warm? The eye should be made up of warm clouds, usually grey or pink colored. White and grey clouds are not one and the same; white clouds are very cold and grey clouds are very warm. If we applied these three steps to CYC1981, we would find that it does have cold clouds at the center, but there are no warm clouds around where the eye should be and the band of clouds around the storm is very weak. For more information, visit another recent post: How do I classify this? False eyes. This post was contributed by Brady Blackburn, an intern with the Cyclone Center team from Asheville High School in Asheville, NC.